Urea–formaldehyde resins are capable of forming cold tack, which is needed in plywood production. Cold tack is influenced by various factors such as veneer moisture content, veneer temperature, and pre-press time. Tensile shear strength and wood failure percentage of bonded birch veneers were examined. Based on statistical analyses, it was concluded that the factors influencing cold tack do not significantly influence the performance of the cured bond line. The pre-pressing of veneers is a production step frequently applied to ensure the veneer stack fits into a multi-daylight hot press (Paulitsch and Barbu 2015). This production step requires cold tack of the resin used. There are various adhesive related and adherend related factors that influence cold tack behavior (Dunky 1998). 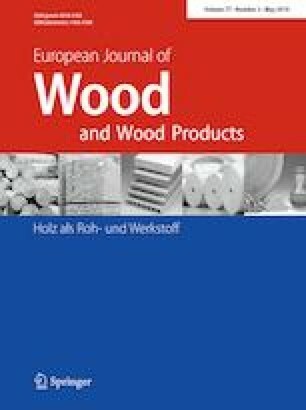 The effect of several factors (lay-up time, veneer moisture content, veneer temperature, resin age, resin amount and pre-press time) on the cold tack of urea–formaldehyde (UF) resin was investigated in a previous study (Hogger et al. 2018). Veneer moisture content (MC), veneer temperature, pre-press time, lay-up time and two-factorial interactions showed a significant impact on the measured tensile shear strength of uncured UF as an indicator of cold tack. However, the influence of the selected conditions on the performance of the cured glue joint has previously not been investigated. The aim of the present study was to close this gap by analyzing the effect of selected factors on the properties of cured glue joints. 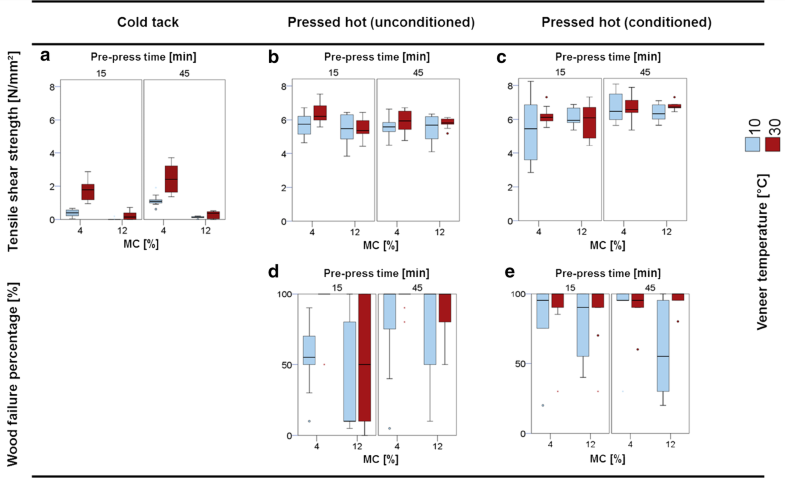 MC, veneer temperature and pre-press time showed the highest impact on cold tack, therefore the minimum and maximum values of these factors from Hogger et al. (2018) were used for this work. Birch veneers (Betula) with dimensions of 500 × 500 mm2 and a thickness of 1.5 mm were stored in standard climate (20 °C, 65% r.h.) prior to specimen preparation. An industrial UF plywood resin, meeting the requirements for formaldehyde emission class E1, with a solid content of 63% (± 3%), viscosity between 300 and 500 mPa*s and density of 1.3 g/cm3 was provided by Metadynea Austria GmbH (Krems, Austria). 1.75% (liquid hardener on liquid resin) of a 20% aqueous ammonium chloride solution was used as hardener (provided by Metadynea Austria GmbH, Krems, Austria). Three relevant parameters (veneer moisture content, veneer temperature, pre-press time) were selected at two levels (high and low) for this work. As described by Hogger et al. (2018), these three parameters had the most severe influence on the cold tack. All samples were stored in standard climate (20 °C and 65% RH) before they were adjusted to the required temperature and MC level (± 1%) using two climate chambers (WTB-Kühlbrutschrank, Binder, Tuttlingen, Germany; Temperature and Climatic Test Chamber WK3 180/40, Weiss Technik AG, Altendorf, Switzerland). In a previous study (Hogger et al. 2018), increasing lay-up time, MC and the two-factorial interaction of resin amount with moisture content decreased cold tack, while higher veneer temperature, longer pre-press time and the two-factorial interaction between lay-up time and MC enlarged the corresponding strength value. Since in previous experiments, both the minimum and the maximum tensile shear strength could be obtained by combining 10 min lay-up time with 150 g/m2 resin amount, these parameters were kept constant in the present study. Thus, the experimental setup was reduced. A detailed sample preparation procedure is available in Hogger et al. (2018). In a full factorial test design, 20 samples were tested for each combination as presented in Table 1. After pre-conditioning and pre-pressing in the respective climates, the veneers were pressed to cure in a hot press (Langzauner GmbH, Lambrechten, Austria) at a press temperature of 110 °C, a specific pressure of 1.5 MPa and a press time of 10 min. Half of the samples were mechanically tested within 30 min after hot pressing (unconditioned) and the other half after 14 days of conditioning in standard climate (20 °C, 65% RH) using a universal testing machine (Zwick/Roell Z020, Ulm, Germany) in tensile shear mode. A load cell with a load capacity of 5 kN and a cross head speed of 3 mm/min was used to induce and measure the applied force. The tensile shear strength (TSS) was calculated by dividing the maximum force by the measured overlap area. The wood failure percentage (WFP) was evaluated visually on the basis of EN314-1 (2005). Experimental results were visualized by boxplots, using SPSS software (Version 21, Statistical Package for Social Science, IBM®, Armonk, USA). The responses and corresponding parameters were analyzed using independent samples Student´s t-tests (TSS) and a Mann–Whitney U Test, as a non-parametric method for the not normally distributed WFP, for p ≤ 0.05. In order to evaluate the influence of the selected factors on the tensile shear strength, a multiple regression analysis with a linear variable selection, based on a t-test, was performed with the statistical software Design-Expert® (version 10, Stat-Ease, Inc., Minneapolis, USA), which led to a poor coefficient of determination (R2). The results are not displayed in this work. The results are presented in Fig. 1 (TSS a–c and WFP of the hot-pressed samples, d and e). While the uncured samples (cold tack) reach TSS median values between 0 and 2.5 N/mm2, the cured samples (both unconditioned and conditioned) reach about 5.5 to 7 N/mm2. Only the WFPs of cured samples are estimated, as hardly any WFPs occurred in uncured samples, and are within a range of 0–100%. The cold tack samples show significant differences in the median values within the pre-press times. With a pre-press time of 15 min, the highest TSS values can be observed at approx. 1.8 N/mm2 given a low MC and high veneer temperature, while the minimum values are achieved at high MC and low temperatures. The same effect can be observed with a long pre-press time (Fig. 1a; results published in Hogger et al. 2018). Regarding the results of hot pressing for unconditioned samples, the highest value for the TSS can be observed at a MC of 4% in combination with a veneer temperature of 30 °C and a pre-press time of 15 min. A statistically significant difference for the mean values of TSS was found within the MC groups (p = 0.035) and veneer temperature groups (p = 0.03). However, all mean values are in a comparably high range of 5.4–6.4 N/mm2. For the conditioned samples, a statistically significant difference was found between the pre-press time groups (p = 0.002). The mean TSS values are in a range typically occurring for using veneer specimens (5.4 and 6.8 N/mm2). Furthermore, no major difference was noted in TSS when comparing unconditioned and conditioned samples (Fig. 1b, c). In general, the median values of the TSS for samples with cured UF are rather similar, and strong influences of the selected parameters are not recognizable, contrary to the case with cold tack. The TSS values obtained suggest that the shear strength of solid wood is tested, rather than the bond strength, which is also reflected in the results of the WFP. The WFP results show generally less wood failure for low temperatures and high MC, but with a higher scattering of the values. However, the assessment of wood failure is a subjective method that can affect the scattering of the values. When comparing the WFP of unconditioned samples with a short pre-press time, the medians differ between 10 and 100%. The statistical evaluation for WFP indicates a significant difference between a pre-press time of 15 min and 45 min for unconditioned samples (p = 0.000). The mean values also differ considerably, with a low veneer temperature and a high moisture content leading to the lowest value, which is also reflected in the significant difference between the MC groups (p = 0.032) and the high and low veneer temperature groups (p = 0.009). Dunky and Niemz (2002) have already described that additional water resulting from increased wood moisture content can slow down the curing reaction, since the equilibrium of the reaction is shifted towards the side of the precursor molecules. The experimental results show that, despite different MC levels, the medians no longer differ at a longer pre-press time. At low veneer temperatures, however, a higher scattering can be observed (Fig. 1d). In contrast, the conditioned samples only show a difference in median values at low temperatures, which results in the lowest value for a long pre-press time and high moisture content (Fig. 1e). The present results indicate that there are still minor influences of the factors to be observed with unconditioned samples, but hardly any more on conditioned specimens, which is well in line with Dunky and Niemz (2002), who stated that the low post-curing of UF is influenced to a small extent by the moisture content in the cross-section of the boards. This behavior should be investigated in further studies. Cold tack is an important property of UF resins used in the plywood production. Various factors such as moisture content, veneer temperature and pre-press time can have an influence on cold tack. The effect of cold tack on the final performance of the cured glue joint was successfully investigated in this work. Factors significantly influencing cold tack, such as veneer moisture content and veneer temperature did not show an influence on tensile shear strength in conditioned state, but veneer temperature influenced wood failure percentage. Pre-press time showed a minor influence, which was however considered negligible since the values are in a comparable high range. When tested immediately after hot pressing in the unconditioned state, minor effects of the investigated parameters could be identified: veneer moisture content and veneer temperature showed significant differences between the groups. In fact, the values of the TSS together with WFP indicate that mainly the tensile strength of solid wood was tested rather than bond strength. Although cold tack is very important in the production and handling of plywood panels, its extent does not affect the performance of a cured, conditioned glue joint. Open access funding provided by University of Natural Resources and Life Sciences Vienna (BOKU). The authors gratefully acknowledge the financial support of the Austrian Research Promotion Agency FFG within the COMET program.